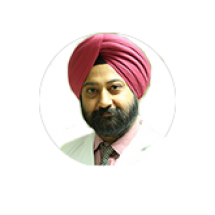 Dr. Ramdeep has immense experience as an Oncologist in treating all types of Cancer patients in leading centers in Delhi. As a Professor of Medical Oncology, he has vast experience in management of complex brain and spinal tumors. His clinical interests include comprehensive management of high-grade gliomas along with the use of multimodality intraoperative monitoring techniques for the resection of brain tumors. He has a special inclination towards the management of brain and spinal tumors through minimally invasive techniques. He also specializes in procedures like Spinal Cord Stimulation and intrathecal morphine pump implantation for patients with intractable cancer pain. He has over 14 years of experience of satisfied patients in his field. He is the first dedicated Neurosurgical oncologist in private sector in Northern India. He is under membership of Neurological Society of India, Delhi Neurological Association and Indian Society of Neuro-oncology. His publication includes Recurrent giant malignant peripheral nerve sheath tumor of the scalp with intracranial extension. Journal of Neuroscience and Behavioural Health Vol. 5(1), pp. 1-4, March 2013. He was the active participator in the CRASH trial for Head injury conducted by MRC.